There are many kinds of chocolate available in the market, but how can we tell fine chocolate from sub-standard ones? The best way to know is to check the labels and read the ingredients. 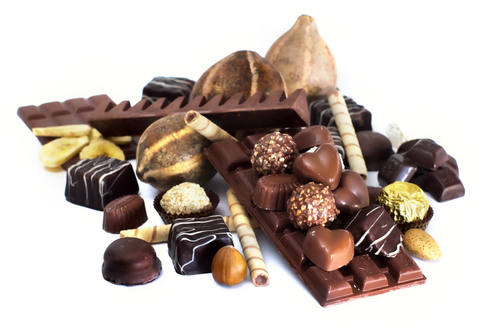 Fine chocolate should contain a standardized set of ingredients, which should never be substituted but can be left out. Dark chocolate Its main ingredients should contain cacao liquor, sugar, cacao butter, lecithin, and vanilla. Milk chocolate Ingredients are very similar to dark chocolate with the addition of milk solids and milk fat. White chocolate Ingredients should include sugar, cacao butter, milk solids, milk fat, lecithin, vanilla. Chocolate confections Its ingredients should consist of cacao liquor, cacao butter, milk solids, butter, vanilla, cacao beans, cacao seeds, cocoa powder, nuts, lecithin, and natural flavors that include either fresh fruit, vanilla beans, fresh herbs, fruit purees, or liquor. Note that some chocolate brands would name certain ingredients differently. Cacao liquor, for instance is also called cocoa liquid, chocolate liquor, or unsweetened chocolate. Cacao butter, meanwhile, also goes by names like cacao oil and cocoa fat. Milk fat can also be replaced by milk, cream, whole milk, condensed milk, or dry milk powder. Lecithin is also labeled as soy lecithin, while vanilla can also be called as vanilla beans (but not vanillin).